We’d love your help. Let us know what’s wrong with this preview of To a God Unknown by John Steinbeck. To ask other readers questions about To a God Unknown, please sign up. I would like to read this book. Can anyone give me a brief summary (no spoilers please!) with a content review? Steinbeck’s second novella is more than the sum of words that composes it. On the surface, a story of a young man called Joseph Wayne who leaves his homeland in Vermont to establish his own farm in Our Lady of the Valley, California. Underneath, a parable that is a converging point between pagan rites, Greek myths and the Old Testament, rich with allegorical meaning and thought-provoking interpretations. The lush, fertile valley that Joseph selects to start a family and a cluster of farms with hi Steinbeck’s second novella is more than the sum of words that composes it. The lush, fertile valley that Joseph selects to start a family and a cluster of farms with his brothers, where harsh work translates into prosperity, seems to be inexplicably interconnected to an ancient oak tree that becomes Joseph’s particular place of veneration. He listens to the crackling sound of boughs and leaves in the restless wind, caresses its bark and seeks its silent advice, as if his father’s spirit were lodged in it, as if all the doubts could be dispelled in the sap that infuses life in the tree. But blessings can turn into curses, and the rains that showered the valley with blossoming abundance suddenly run dry, turning a fecund land into a sterile, parched desert where death and desolation obliterate all trace of bygone love and fortune. Steinbeck’s novel follows a linear narrative that is strongly marked by the passing seasons, but its heart pulsates in the silences of what is not written, and only sensed by the careful reader. The storyline is replete with undisclosed but powerful forces that bespeak of the abyss of a life greater than our own. With atmospheric descriptions of the landscape and sparse dialogue, Steinbeck builds a whole universe, the history of mankind in little more than two hundred pages. Joseph’s love is collective and all-embracing; men, women, children of all races and tribes, but also the earth with its rivers, valleys and wildlife, are the recipients of his spiritual compulsion. Religious intolerance and a number of fatal accidents will threaten Joseph’s soul, this anima mundi that inhabits in him and that keeps the balance of things, and a sacrifice will be required to restore the natural cycle in the shriveled valley. There is little doubt that the migrants to the Salinas Valley of central California around the turn of the 20th century thought they had arrived in Paradise - like the Spanish and native settlers before them. This is why Joseph and his brothers quit their inhospitable Vermont. The climate was perfect. The resources and beauty abundant. The soil was fecund and waiting for seed. And the available technology was just right to exploit it all. But the beautiful land has a history, mostly unrecorded; and it has ghosts. The ghosts include the present inhabitants, not only those of the past; some are even imported. The most recent ghosts are only vaguely aware of the history of the beautiful land. They live in a sort of hopeful fantasy of better things to come. The fantasy calms the fears generated by the history. But not entirely. Certain mysteries - in the land and in other people - don’t conform to the demands of the fantasy. These are annoying aberrations which pick away at one’s consciousness. Both the land and people behave irrationally. The problem with fantasy is that it becomes toxic like an infected wound if it isn’t expressed and shared. Unfulfilled visions become resentments. Inarticulate dreams develop into emotional cancers. The more they are disappointed the deeper the fantasies are buried in the unconscious whence they manipulate mercilessly as if their existence is at stake - which it is. The personal symbology of fantasy is complex. The smell of sage is too intimate to be communicated, even if one were aware of its effect. The goat-like shape of a mountain crest with glowing eyes at sunset is somehow vitally important, but inexpressibly so. Walking through a mountain pass feels like a fundamental change in one’s existence; but it would sound mad to discuss it. Then there’s the meaning of a father’s blessing - an even deeper mystery. Symbology slips into religion, or at least something like it, without warning. Hidden meanings emerge from nowhere. A boulder in a remote clearing creates fear; an unexpected encounter with a bull could signal forthcoming disaster; even one’s husband can be confused with Christ. People can end up worshipping things because of their symbolic power alone. When a person becomes a symbol of himself to himself, he is transformed. He is no longer strictly human; he becomes either divine or demonic, perhaps both. He may not realize the change, but others do if it confirms their own hidden fantasies. Some call it charisma, this capacity to tap the fantasies of others. But it is as likely a personality defect as it is a talent. This is how a husbandman like Joseph sees himself - as divinely responsible for his stock, his land, his family and fully competent to lead. He is in charge. He decides. But of course he isn’t and he doesn’t. His fantasy is dependent upon the cooperation of things over which he has no control whatsoever - the weather, a mis-placed foot, other people, circumstances. Back in 2012 I embarked on a project of reading my way through the works of John Steinbeck. Looking back on it, I should have developed a bit more of a plan: reading the novels in chronological order probably would have appealed to my Virgo tendencies. As it is, I started with Cannery Row, moved on to The Grapes of Wrath and then just read whatever came my way. Having finished To a God Unknown, I now only have one more novel– Steinbeck’s first, Cup of Gold – and a couple of volumes of non-fiction to read. This work, Steinbeck's second novel, was written over a number of years and underwent significant revision during that time. Originally adapted from a play written by a fellow Stanford University student, Steinbeck ultimately moved significantly away from the original work. This early in his literary career, Steinbeck wanted to write about archetypes and heroes rather than about the ordinary people whose lives he evoked with such skill in The Grapes of Wrath, Of Mice and Men and Cannery Row. Steinbeck’s central character, Joseph Wayne, has little in common with the characters of his best-known works. Joseph is a visionary, with something of an Old Testament prophet about him: a man obsessed with his land. A complex, interesting character, he dominates the narrative so much that the other characters are flat when compared to him. Other than Joseph Wayne, what is most impressive about the novel is the focus on the Californian setting: the landscape is as vital as any human character. Steinbeck’s description of the natural environment - rather than the characters or the underlying philosophy - will stay with me for a long time. There are few 20th century writers who speak to me in quite the same way as does Steinbeck. It’s going to be a sad day when I finally finish the Steinbeck project. However, I guess I can always go back to the beginning, maybe with a bit more of a plan next time. John Steinbeck impõe-me cada vez mais respeito. Voltei atrás, a relembrar o que já li dele, e a verdade é que todos se destacam pela intensidade das personagens e das histórias. Histórias que nos arrastam desde o início numa torrente de fatalidade irremediável, num prenúncio nem sempre claro, mas indubitavelmente presente e ao qual não escapamos. E por mais que a dor nos consuma, por mais que desejemos um outro desenrolar, sabemos que aquele é o desenlace perfeito - quebra-nos o coração, mas não John Steinbeck impõe-me cada vez mais respeito. Voltei atrás, a relembrar o que já li dele, e a verdade é que todos se destacam pela intensidade das personagens e das histórias. Histórias que nos arrastam desde o início numa torrente de fatalidade irremediável, num prenúncio nem sempre claro, mas indubitavelmente presente e ao qual não escapamos. E por mais que a dor nos consuma, por mais que desejemos um outro desenrolar, sabemos que aquele é o desenlace perfeito - quebra-nos o coração, mas não podia ser de outra maneira. A um Deus desconhecido, não tem um enredo complicado, no entanto, envolve-nos até à medula numa história de sentimentos primitivos e ligações primordiais à mãe terra, aos elementos, aos animais, à força inexorável da natureza. این کتاب رو اولین بار شش سال پیش خوندم و تنها چیزی که ازش یادم مونده بود غم سنگین عجیبی بود و همذات پنداری شدید با شخصیت اصلی. امروز که میرفتم چند تا بسته پست کنم با خودم برداشتمش که اگه صف طولانی شد یک دور دیگه بخونمش تا بتونم تصمیم بگیرم که آیا این کتاب همراه من می مونه یا نه. اگه این قسمت که آقای گرامی بغل دستی من که دماغشون توی کتاب بنده بود و یک بار هم درخواست کرد که آرومتر ورق بزنم رو نادیده بگیریم, قسمت جالبش برام دوباره همون حس های چند سال پیش بود. همون غم سنگین عجیب. همون تاثر شدید. یه مل این کتاب رو اولین بار شش سال پیش خوندم و تنها چیزی که ازش یادم مونده بود غم سنگین عجیبی بود و همذات پنداری شدید با شخصیت اصلی. Nem sei bem que diga, fiquei um bocado abananada por esta história, duma intensidade que parece atravessar décadas e continentes, transmitida através duma escrita superior, incisiva e sem floreados, mas com uma sensibilidade que me surpreendeu. A história é excelente, tal como os personagens e as descrições dos ambientes; é perceptível que o autor conheceu aqueles locais, mas ilustrá-los desta forma não é para qualquer um. Foi o meu primeiro Steinbeck e certamente não será o último, embora já tenha lido que em outras obras a escrita não é tão visceral. Tenho pena de não dar as 5 estrelas, mas houve alguns pormenores pouco verosímeis que me fizeram confusão (nomeadamente alguns dos pensamentos do protagonista). P.S. Evitem ler a sinopse, pois revela muito mais do que devia. Eu não sabia nada da história e estou convencida que a experiência foi melhor por isso. I don't really know what to say, I was a bit overwhelmed by this story, which has an intensity that seems to cross over decades and continents, conveyed through a superior, incisive, bare writing that surprised me, nonetheless, with its sensibility. The story is excellent, and so are the characters and the descriptions of places and ambiences; we can see that the author knew those places, but not everyone could depict them like that. This was my first Steinbeck and it certainly won't be my last, although I read somewhere that his writing in other works is not as visceral. I feel bad not giving this book the full 5 stars, but there were some implausible details that confused me (namely some of the main character's cogitations). Wow, this book affected me more than any other book in a long while. First, Steinbeck's writing is pure beauty. Sometimes I stop and savor each sentence, particularly in descriptive passages, and the perfection with which he writes is unbelievable. Like the protagonist, Joseph, I love and feel connected to nature in a deep and a strong way. I also have a strong sense of the sacred that permeates my everyday experiences; Joseph seems always distracted by this, and thus disconnected from others. The novel makes use of a lot of Biblical images from the early books, and since I have been reading those in The Message version of the Bible, I recognized these in relief in a way I probably wouldn't have otherwise. This was the passage that struck me most. Malcolm Gladwell could have quoted it in Blink. It captures the essence of the book. "You really want to know why I watch the sun-- why I kill some little creature as it disappears." He paused an ran his fingers through his hair. "I don't know," he said quietly. "I have made up reasons, but they aren't true. I have said to myself, 'The sun is life. I give life to life'--'I make a symbol of the sun's death." When I made these reasons, I knew they weren't true." He looked around for corroboration. Joseph broke in, "These were words to clothe a naked thing, and the thing is ridiculous in clothes." "You see it. I gave up reasons. I do this because it makes me glad. I do it because I like to." I loved this book for its naked, mysterious truth. Sicuramente Steinbeck conosceva bene la Bibbia, molto meglio di me che pure vado a messa tutte le domeniche. La sua produzione o perlomeno quello che io ho letto della sua produzione letteraria, sin qui cinque opere, ne è pervasa; che si tratti dell'esodo dei contadini di Furore che partono in massa verso la terra di latte e miele, o degli abitanti della verde vallata de I pascoli del cielo ai quali "il Signore li conduce", o dell'altare di Al Dio sconosciuto e del suo intrinseco richiamo a San Paolo e agli Atti degli Apostoli, la Bibbia e la spiritualità nei suoi romanzi sono ovunque. Quest'aspetto di Steinbeck mi affascina moltissimo, lui così concreto, così sensibile e attento alla condizione terrena dell'uomo e alle sue necessità primarie, eppure allo stesso tempo così ricco di misticismo e simbolismi religiosi, e i suoi personaggi che sembrano sempre essere pronti a sfidare Dio ma costretti, quasi sempre, ad arrendersi e ad essere annientati dal destino e dall'assenza di una Provvidenza salvifica. Crede in Dio Joseph Wayne, ma non spera in Dio: crede nella Terra, Madre e Dio allo stesso tempo, l'unica che possa condannarlo o salvarlo. Un Dio sconosciuto che gli nega l'acqua per sopravvivere, che lo rende indifferente alle necessità dell'essere umano - la moglie Elizabeth su tutti - distratto dalla sete delle terre e delle creature viventi, un Dio che lo trascina in un vortice senza fine verso la Passione. Steinbeck ci accompagna in questa drammatica ricerca della salvezza che porterà la famiglia Wayne ad abbandonare il natio Vermont per migrare in California, alla ricerca di terre libere da coltivare e dove poter costruire la propria casa, attraverso una prosa ora lirica e ricca di colori (la traduzione sarà sì datata come sottolineato da molti, ma conserva e rende indubbiamente riconoscibile la matrice poetica dell'autore) ora aspra e polverosa; sembra quasi possibile poter riconoscere solo attraverso le parole dell'autore le variazioni cromatiche dei campi, delle foglie sugli alberi, dei fili d'erba nelle vallate e vederle trasformare davanti ai nostri occhi: ora verde brillante, ora verde scuro, ora ocra, in uno spasmo che in assenza di acqua dalla vita conduce alla morte. “To a God Unknown” is my first read by Steinbeck. I owned an old edition of The Grapes of Wrath, but I remember start reading it and being lost in so much description. Description is, precisely, what worked so well in this book. The title is a marvel, and the book revolves around its symbology with admirable grace. The script is rather simple: land in the West Coast is being given away and Joseph Wayne, who always dreamt of possessing something of his own, says goodbye to his dying father and leaves. The book is full of emotion, intuition and supersticion, and I believe the main characters never really forgives himself for having left so abruptly, when his model, the father, had told him that his death was near and that he would then follow him in spirit until his new home. The new land is wild and unknown (much like its gods), and Steinbeck depicts it in a way that brings us the scent of laurel, humid earth, animal furr, while our audition is visited by the animals pace, the water springs tripping on rocks, and the growl of the coyotes, the stables door sizzling, etc.. When it comes to the setting, the book is four-dimentional. I was surprised by the deepth of humanity in every reaction of this people. Joseph ends up gathering his brothers, once they hear of his prosperity; Burton and his wife, Jennie, comes along with Thomas and his prole, Rama and the kids, to live side by side with him. Joseph is the brother who offers more layers. He is a mix of acceptance, enthusiasm, spirituality and at last dispair. All in an homogenous way, so though his life is connected to the Earth’s, he easily accepts other people’s beliefs and he understands them. Unlike others around him, who get offended towards those who differ from them, Joseph loves and respects the land, and compromises to protect it from any threat – which, for the effect, represent the cyclical years of drought, remembered with angst by the locals of Nuestra Señora. There are indians, portuguese and mexicans living in the surroundings. The first believe in the rites of the earth: sacrifices, dances and gifts. The second and the third ones are deeply catholic, and therefore owe Father Angelo their spiritual salvation. The Wayne family is protestant, and Burton, the most religious of the three brothers, feels uncomfortable on that land, which appears to him as heredic and consagrated to the devil. On the other hand, Thomas, who’s actually more rude, has an unique connection to animals. He respects them, tames tham and inflicts them pain and death as if his soul and theirs was as one. He isn’t as introspective as Joseph is, but he is equally reflexive and cultivates deep beliefs. He is the brother whose religiosity is conservative, but his mind reaches further than his brother’s Burton – which ideas can’t deviate much from the scriptures. Joseph, excited by the prespective of a prosperous life, looks around and sees his animals reproducing, the nature in extasy, the sun and the rains in harmony, and he convinces himself that such richness comes from his father’s blessing, which spirit would be present in the branches of an old oak tree. He seeks advice by that oak, returning whenever he wants to share something that might sound ridiculous to his equals. Spirituality appears as something intimate, which advantage is that of making us feel good about the world, and its rites don’t need to be imposed to those surrounding us. It’s also understanable that cracking one’s beliefs, just because they seem unlogical, causes major distress. Joseph, self satisfied, even agrees with throwing a party to honor his land’s fertility, to which he invites Father Angelo. The priest celebrates a mass and places the images of Our Lady and Christ in the altar, to be adored. This disturbs his brother Burton, who predicts disgrace coming out the idolatry and pagan rites. In my opinion, Burton is fearful. He believes in a revengeful and choleerc God, a not so tolerat one, and he feels like his brother is exposing them all to an undeserved punishment. It’s a long slow process for a human to die. We kill a cow, and it is dead as soon as the meat is eaten, but a man’s life dies as a commotion in a still pool dies, in little waves, spreading and growing back toward stillness. The beauty of the narrative comes from the pueril depictions of nature, and how it appears as sometimes simple, sometimes uncomprehensible. It relies, mostly, in the fact that the universe means different things to each character and each one is faithful to what keeps him calm: so as Joseph needs the oak to feel safe, Thomas uses the animals to the same effect and Burton seeks comfort in the scriptures and religious camps. Some others need to be covered in animal skin and dance over mud, even roll in it, to show their gratitude about the upcomng rain. And someothers think that they must sacrifice a creature at every sunset, so that his land will continue on being fertile. God is something different to each and everyone of them, and the other’s incomprehensin throws shadows upon their existance. The main idea – to which I agree – is that God is a personal entity to each one of us, and you can find it in whatever brings you comfort and peace, without the need of a logical explanation. A beautiful treaty on religious tolerance, in a time in which being different means a threat. If we’re capable of recognizing how intimate is th relationship between each being and the universe, maybe spiritual well-being can be reached by everyone. I also compliment the timelessly trait of this book, written in 1933 and so contemporaneous, as well as the feminility that comes from its nature in splendor, and the tenderness between Steinbeck’s men and their beloved women. I can’t wait to read this author again. "A Um Deus Desconhecido" é a minha estreia com Steinbeck. Tinha uma edição antiga de As Vinhas da Ira, mas lembro-me de começar a ler e de ficar perdida em tanta descrição. A descrição é, precisamente, aquilo que me prendeu de modo tão eficaz a este livro. O título é delicioso, e o livro dança em redor da sua simbologia com uma graciosidade admirável. O enredo é relativamente simples: estão a dar terras na costa Este e Joseph Wayne, que sempre sonhou em possuir algo de seu, despede-se do pai, quase um moribundo, e parte. Contudo o livro está prenhe de emotividade, de intuição e de superstição, e creio que a personagem principal não se perdoa por ter partido de modo tão impaciente, quando o seu modelo, o pai, lhe garante que pouco falta para morrer, e que então poderia acompanhá-lo em espírito até ao seu novo lar. O novo território é quase selvagem, e Steinbeck descreve-o de modo a que nos chega aos sentidos o perfume dos loureiros, da terra húmida, do pêlo das vacas e dos cavalos, enquanto a audição acompanha os cascos das bestas em trote, os cursos de água em confronto com as pedras, o uivo dos coiotes, a porta do celeiro que range. Em termos de cenário, o livro é a quatro dimensões. Surpreendeu-me também a profunda humanidade em cada reacção destas pessoas, porque, em breve, ao dar notícias da sua prosperidade aos irmãos, Burton e a esposa, Jennie, e Thomas e a respectiva, Rama, juntam-se-lhes com a sua horda de filhos. Joseph é o que nos oferece mais camadas, é uma mescla de aceitação, entusiasmo, desalento, espiritualidade e depois desalento. Tudo de modo homogéneo, apesar de q sua vida estar ligada à da sua terra, aceita com facilidade as crenças dos outros e entende-as. Ao contrário dos que o rodeiam, que se melindram com os diferentes. Joseph ama e respeita a terra, comprometendo-se a protegê-la de qualquer ameaça - que, para o efeito, são os anos de seca cíclicos, narrados com dissabor pelos homens da população local, Nuestra Señora. Andam por ali índios, portugueses e mexicanos. Os primeiros têm crenças ligadas aos ritos da terra: sacrifícios, danças e oferendas, clareiras sagradas onde grandes rochedos cobertos de musgo convidam as grávidas à reflexão. Os segundos e os terceiros são profundamente católicos, e devem ao Padre Ângelo a sua salvação espiritual. O clã Wayne é protestante, pelo que Burton, o mais religioso dos irmãos, se sente desenraizado naquela terra, que desde o início lhe parece herege e devota ao demónio. Por outro lado, Thomas, mais rude, tem uma relação única com os animais. Respeita-os, domestica-os, inflinge-lhes a dor e a morte como se a sua alma fosse uma só com a deles. Não é tão reflexivo quanto Joseph, mas é igualmente introspectivo e de valores profundos. É o irmão cuja religiosidade é conservadora, mas a mente alcança um pouco além das escrituras. E depois Joseph, que, no ímpeto de se ver feliz e perante uma tal promessa de prosperidade, olha em redor e vê os animais a reproduzirem-se, a natureza em êxtase, o sol e as chuvas em harmonia, e convence-se que tanta bonança advém da bênção do seu pai, cujo espírito estaria presente nos ramos de um velho carvalho. Junto do carvalho busca conselho, regressando sempre que necessita de partilhar algo que, aos outros, poderia soar ridículo. Entende-se assim como a espiritualidade é algo de íntimo, e que se a sua vantagem é a de nos fazer sentir bem com o mundo, então os seus ritos não devem ser impostos a quem nos rodeia. Entende-se também quão destabilizador é, que alguém nos rache as crenças ao meio, só porque lhe parece desenxabidas. Joseph, de bem consigo mesmo, acaba inclusive por permitir que se celebre uma festa em honra da fertilidade do local, para a qual convida o padre Ângelo, que celebra missa e traz as imagens de Nossa Senhora e de Cristo para o altar improvisado. Isto transtorna o seu irmão Burton, que profetiza que toda aquela idolatria e paganismo acabarão por levá-los à desgraça. Na minha óptica, Burton tem receio. Crê num Deus vingativo e colérico, pouco tolerante, e sente que o irmão está a expô-los a todos a um castigo imerecido. A morte de um humano é um processo longo e demorado. Matamos uma vaca, e a mesma está morta assim que a carne seja comida, mas a vida de um homem morre como uma comoção numa poça tranquila, em pequenas ondas, expandindo-se e regressando à imobilidade. A beleza da narrativa consiste nas descrições pueris da natureza, e de como a mesma ora é simples, ora é incompreensível. Mas reside, sobretudo, no modo como o universo significa coisas tão diferentes para cada personagem, e cada um é devoto àquilo que o tranquiliza, sendo que Joseph precisa da árvore para se sentir seguro, Thomas dos animais e Burton das escrituras e dos acampamentos religiosos. Há ainda quem precisa de se cobrir de peles de animais para ir festejar as chuvas, e se rebole na lama para o mesmo efeito. E depois há quem sinta que deve sacrificar a cada pôr do sol uma criatura diferente, para que na sua terra se multipliquem as sementes e a humidade a mantenha fértil. Deus é algo diferente para cada um deles, e a incompreensão por parte dos outros lança sombras sobre a existência de cada um. A ideia geral - e que corroboro - é que Deus é uma entidade pessoal para cada um de nós, e podemos encontrá-lo naquilo que nos traz conforto e paz, sem que exista uma explicação lógica. Um belo tratado sobre tolerância religiosa, numa altura em que o diferente voltou a significar ameaça. Se formos capazes de reconhecer a intimidade premente entre cada um e o universo, talvez o bem-estar espiritual chegue a todos. Um elogio ainda ao evidente carácter intemporal do livro, escrito em 1933 e tão contemporâneo, bem como à feminilidade que brota desta natureza em esplendor, e à ternura e entendimento entre os homens de Steinbeck e a mulher amada. Mal posso esperar por voltar a ler o autor. "I do not know whether there are men born outside humanity, or whether some men are so human as to make others seem unreal. Perhaps a godling lives on earth now and then...I tell you this man is not a man, unless he is all men." 4.5 stars. This book has so much symbolism and layers of meaning that I will probably read it again to try to absorb everything. I can't believe this was one of the first books Steinbeck wrote; it seems like something written at the end of a writer's career. It is rich an "I do not know whether there are men born outside humanity, or whether some men are so human as to make others seem unreal. Perhaps a godling lives on earth now and then...I tell you this man is not a man, unless he is all men." Μια από τις καλύτερες εκδόσεις που συνάντησα ποτέ και μια άψογη μετάφραση του Κοσμά Πολίτη. Ένα συλλεκτικό παλαιό βιβλίο που πραγματικά αξίζει να το έχει κανείς στη βιβλιοθήκη του. Πολύ ωραία η εισαγωγή του Αντώνη Σαμαράκη και τα σκίτσα στην αρχή του κάθε κεφαλαίου δίνουν μια ταξιδιάρικη ώθηση στη φαντασία του αναγνώστη. Και για όσους ενδιαφέρονται για τον Steinbeck, υπάρχει στο τέλος μια υπέροχη ιστορική αναδρομή στους προγόνους του, στη ζωή και στο έργο του, καθώς και μια συλλογή από σπάνιο φω Μια από τις καλύτερες εκδόσεις που συνάντησα ποτέ και μια άψογη μετάφραση του Κοσμά Πολίτη. Ένα συλλεκτικό παλαιό βιβλίο που πραγματικά αξίζει να το έχει κανείς στη βιβλιοθήκη του. Πολύ ωραία η εισαγωγή του Αντώνη Σαμαράκη και τα σκίτσα στην αρχή του κάθε κεφαλαίου δίνουν μια ταξιδιάρικη ώθηση στη φαντασία του αναγνώστη. Και για όσους ενδιαφέρονται για τον Steinbeck, υπάρχει στο τέλος μια υπέροχη ιστορική αναδρομή στους προγόνους του, στη ζωή και στο έργο του, καθώς και μια συλλογή από σπάνιο φωτογραφικό υλικό του ίδιου. Η κάθε σελίδα της ιστορίας είναι κι από ένας ύμνος στη φύση, τις ομορφιές της και σε όσα προσφέρει αυτή στον άνθρωπο. Αυτή η ιστορία επιδέχεται πάρα πολλές ερμηνείες, ίσως τόσες όσες και οι αναγνώσεις. Παρακολουθούμε τέσσερις διαφορετικές ιδιοσυγκρασίες, έναν φυσιολάτρη, έναν θρησκόληπτο, έναν λάτρη του ζωικού βασιλείου και έναν μεθύστακα. Συγκρούονται τα "πιστεύω" του καθενός και ο αναγνώστης μπορεί να βγάλει τα δικά του συμπεράσματα σχετικά με το ποιός θεός από αυτούς που λατρεύονται υπερισχύει. Είτε η Φύση, είτε ο Θεός του Χριστιανισμού(Χριστός), είτε ο Ήλιος. Ένα άλλο θέμα που εγείρεται είναι η θυσία στον εκάστοτε θεό και η αξία της. Ταξίδεψα πολύ με αυτή την ανάγνωση σε πανέμορφα φυσικά τοπία, χάρη στις πολλές περιγραφές της φύσης, ενστερνίστηκα τις ανησυχίες του ήρωα και παρακολούθησα τα πάθη του με μια γλυκιά μελαγχολία. Είναι αναμφίβολα ένα λυπητερό μυθιστόρημα, γιατί η μοίρα δεν στέκεται γενναιόδωρη απέναντι στους ήρωες, παράλληλα όμως υπάρχουν διάφορα αισιόδοξα μηνύματα. An early Steinbeck filled with amazing biblical, pagan, and Greek images. The novel sketches the relationship between Joseph and his efforts homesteading out West with his family. It is a story of four brothers who move from the East (Vermont) to the West (California) to work the land and raise cattle. Joseph Wayne isn't the oldest, but he is the leader/patriarch of the brothers ever since their dying father gave him his blessing (hints at Isaac’s blessing on Jacob). Joseph is convinced that his father's spirit abides in a large oak tree on his farm. He communes, talks, seeks advice and sacrifices to the Oak. He ends up a prophet without a message, a seer without the word. It is only the land that matters to him. Δε με ενθουσίασε αλλά δε με άφησε και αδιάφορο. Κατά τη γνώμη μου δε μένει όπως πχ Τα σταφύλια της οργής. Διαβάζεται όμως εύκολα και ευχάριστα, έχει πλοκή και ανατροπές. Ο τίτλος του βιβλίου δε κατάλαβα που ακριβώς αναφέρεται, ίσως στο ότι πολλά σημεία του βιβλίου έχουν να κάνουν με την πίστη των ανθρώπων σε ότι νομίζουν πχ ένα δέντρο, έναν βράχο ή σε μια δύναμη που ονομάζουν Θεό και Τον πιστεύουν με πάθος. Κατά σύμπτωση είδα την περίοδο που το διάβαζα ένα ντοκιμαντέρ του NatGeo σχετικά με τις π Δε με ενθουσίασε αλλά δε με άφησε και αδιάφορο. Κατά τη γνώμη μου δε μένει όπως πχ Τα σταφύλια της οργής. Διαβάζεται όμως εύκολα και ευχάριστα, έχει πλοκή και ανατροπές. Ο τίτλος του βιβλίου δε κατάλαβα που ακριβώς αναφέρεται, ίσως στο ότι πολλά σημεία του βιβλίου έχουν να κάνουν με την πίστη των ανθρώπων σε ότι νομίζουν πχ ένα δέντρο, έναν βράχο ή σε μια δύναμη που ονομάζουν Θεό και Τον πιστεύουν με πάθος. Κατά σύμπτωση είδα την περίοδο που το διάβαζα ένα ντοκιμαντέρ του NatGeo σχετικά με τις περιοδικές ξηρασίες και τα προβλήματα νερού στην κατά τα άλλα εύφορη περιοχή των Δυτ. ΗΠΑ όπως αναφέρεται και στο βιβλίο. Το διάβασα από μια παλιά, πανέμορφη, βιβλιοδετημένη έκδοση (εκδόσεις Κοράλλι) του 1968. Έχοντας διαβάσει το Άνθρωποι και Ποντίκια, το Σε έναν άγνωστο θεό ήταν λίγο κατώτερο των προσδοκιών μου (αλλά καλύτερο από το Δρόμο με τις φάμπρικες, αν θέλω να τα κατατάξω κάπως). Ο Τζόζεφ λατρεύει τη γη, τη φύση και τη ζωή που γεννάται από αυτή. Η λατρεία του φτάνει σε σημείο παγανισμού, που εγείρει αντιδράσεις από τον θρήσκο αδερφό και φόβο από τους υπόλοιπους οικείους. Ο Τζόζεφ πιάνει στα χέρια του μια εύφορη κοιλάδα και τη γεμίζει ζωή. Το χώμα και τα ζώα αναπαράγουν την ύπαρξή τους. Pensei que me fosse mais fácil escrever sobre este livro, mas talvez noutra altura. Por enquanto quero só dizer que foi uma experiência bastante enriquecedora e que tenciono, quando tiver mais disponibilidade, ler outras obras do autor. Muito, muito recomendado. I opened this book for the first time - one of the few Steinbeck novels I had not yet read - shortly after completing my own first attempt at writing a novel. The little book is one of Steinbeck's earliest published works and, interestingly enough, the one that took him the longest to complete. It was in this context that I found the book most provoking: myself an aspiring writer, it was interesting to witness part of the development of one of my favorite novelists. Although not yet as strong an I opened this book for the first time - one of the few Steinbeck novels I had not yet read - shortly after completing my own first attempt at writing a novel. The little book is one of Steinbeck's earliest published works and, interestingly enough, the one that took him the longest to complete. It was in this context that I found the book most provoking: myself an aspiring writer, it was interesting to witness part of the development of one of my favorite novelists. Although not yet as strong and defined as in his later works, the classic Steinbeck tone is still there, and, of course, it is set against the oft-revisited setting of the fertile farmlands of Central California. What prevents me from giving this book a higher rating is that, in the scope of Steinbeck's literary career, it is not very impressive. The characters do not gel together as flawlessly as those in most of his later works and the classical allusions to parallel stories and characters in the Bible are a bit shaky and somewhat inconsistent. Nevertheless, what prevents me from giving this book a lower rating is that it remains a thoughtful, intriguing, and insightful piece on the nature of man's relationship to the land and to God. I'll call this creepy Steinbeck. The detached writing style added a sinister element to these common place events and conversations. This story also took dark turns at almost every chance it got. I don't really understand Steinbeck's intent for this book, but I think I'd be a good read to kick off October. Just play creepy music in the background and nearly all the scenes will take on a menacing tone. Nu tot ce este bun este în totalitate bun și nu tot ce este rău este în totalitate rău. Acesta este sentimentul pe care mi l-a lăsat această carte încărcată de simboluri și descrieri care m-au acaparat cu totul în poveste. 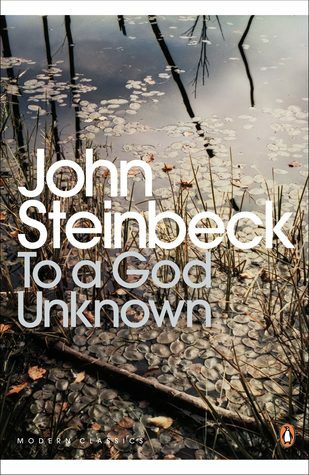 Although it runs only 240 pages (compare that to East of Eden at 601 pages), To a God Unknown was the project which took Steinbeck the longest to complete. It was only his second full-length novel, and he worked on it over a period of five years, nearly scrapping it on more than one occasion. And despite all of his revisions and efforts he just did not succeed in making it a great piece of literature. 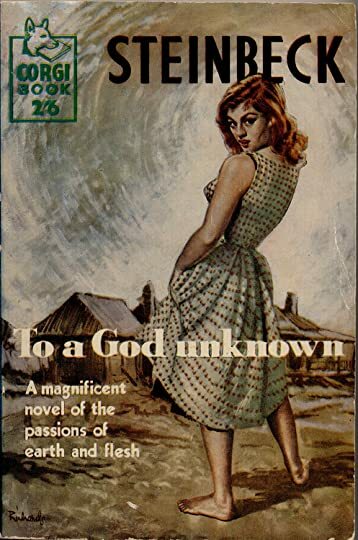 Now don't get me wrong -- it is still in an entirely different league than the pulpy kind of gar Although it runs only 240 pages (compare that to East of Eden at 601 pages), To a God Unknown was the project which took Steinbeck the longest to complete. It was only his second full-length novel, and he worked on it over a period of five years, nearly scrapping it on more than one occasion. And despite all of his revisions and efforts he just did not succeed in making it a great piece of literature. Now don't get me wrong -- it is still in an entirely different league than the pulpy kind of garbage that sells by the cartload at the grocery checkout line, and it should have been more obvious to the critics of the day that this young author had great potential. But ultimately To a God Unknown is an example of a writer overreaching, straining to attain lofty heights and instead painfully falling short. 1) Not all projects or ideas are created equal. To a God Unknown sprang out of a play that one of Steinbeck's friends had written in college. Being a young and inexperienced author, Steinbeck may have thought it would be easier to build on an existing storyline and set of characters, despite the fact that the source itself did not receive many accolades. But the kernel of the story was just lacking something. I have no doubt that Steinbeck greatly improved it in his version, but a plot focusing on a farmer who reverts to pantheism and ultimately sacrifices his own blood to feed the drought-ridden land simply does not resonate with the average person,* no matter how talented Steinbeck himself was. It's the literary equivalent to Christopher Nolan's film, Insomnia, which also showed that all the talent in the world can't make up for a weak story line, even if it is well executed. Before pouring five years of his life into a story that was fundamentally flawed, Steinbeck would have been well-advised to spend more time elaborating a better premise. 2) Establishing your voice is crucial. Even the most casual fan knows that Steinbeck's books generally take place in the Salinas region of California, and that his works are populated by the most common of people. In To a god Unknown he is still honing this voice, and makes the ill-fated decision to focus on a character who is larger than life. Joseph (modeled after the biblical figure) is a man who nobody -- not his wife, brothers, or ultimately the readers -- can relate to, because he is intentionally designed to be more. He has feelings and desires that the average person cannot relate to, and his behavior and beliefs are, at times, simply inexplicable. It wasn't until Steinbeck discovered his ability to relate to the common man with his next novel, Tortilla Flat, a story about wine-drinking, fun-loving paisanos in Monterey, California, that he achieved critical success. 3) To succeed at being an author, you have to WORK. Those were an incredibly trying five years for Steinbeck, during which time he weathered many setbacks and rejections. We have the benefit of hindsight to know that it all turned out well in the end, but for the young author he had no way of knowing that he would ever succeed. His first novel, Cup of Gold, had hardly sold at all, and for five long years he divided his time between trying to sharpen a story which would ultimately defeat him, and trying to sell a story he was faltering with to publishers who had no faith in him. If he had not slogged through this book and seen its publication (and subsequent lack of success) and still been willing to push onward, the world would never have known Of Mice and Men, The Grapes of Wrath, The Red Pony, or The Winter of our Discontent. Ultimately I would love to be responsible for a failure as great as To a God Unknown. It is easy to follow the link from this novel, with its tragedy and gritty earthiness, to Steinbeck's masterpieces. But, somewhat ironically, this novel does a better job at illuminating the enormous character of Steinbeck than it does at interesting the reader in the artificial and ambiguous Joseph Wayne. Книгата на Джон Стайнбек „To a God unknown“ (Към един незнаен бог) беше втората книга прочетена по препоръка на приятел. И втората книга на Стайнбек, която въобще чета. Първата ми среща с автора беше чрез „За мишките и хората“, която ме остави с доста постни впечатления и въобще не ми допадна. Ако не беше препоръката най-вероятно въобще нямаше да посегна отново към Стайнбек, но сега не съжалявам. Историята сама по себе си не блести с оригиналност – Джоузеф Уейн напуска бащиния дом и заминава за да Книгата на Джон Стайнбек „To a God unknown“ (Към един незнаен бог) беше втората книга прочетена по препоръка на приятел. 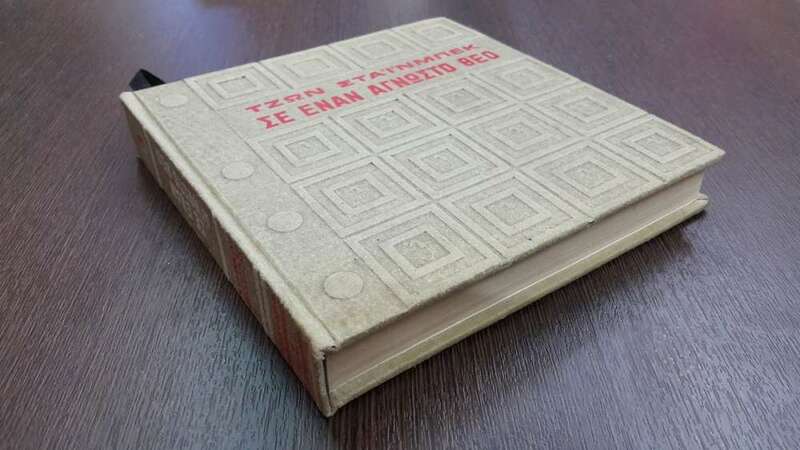 И втората книга на Стайнбек, която въобще чета. Историята сама по себе си не блести с оригиналност – Джоузеф Уейн напуска бащиния дом и заминава за далечна и непозната земя за да сложи началото на живота, за който е мечтал, живот в единение със земята. Джоузеф изгражда голямо стопанство в новите земи. Братята му и техните семейства се присъединяват към него след смъртта на баща им. Никой от тях обаче няма тази страст и любов към земята, каквато има Джоузеф и това го превръща в естествения лидер. Земята е неговия Бог олицетворен от голямо дърво растящо до къщата му. Това което ме привлече в романа беше една особена тиха страст, с която беше разказана историята. Една трескава меланхолия. Въпреки постното начало историята беше много пълнокръвна. Действието се развиваше толкова естествено и в същото време имаше неочаквани за мен моменти. Финалът е много силен и разтърсващ! Дори само заради него си струваше четенето на книгата. Desconhecido, mas não irreconhecível. O segundo romance de Steinbeck tem os seus aspectos mais crus, mas a constante tensão que irradia demonstra arte. A própria sinopse é reveladora de desgraça: Joseph obtém a benção do pai para se mudar para um vale na Califórnia onde, após a morte do patriarca, desloca os seus três irmãos. No novo rancho da família, Joseph acredita que o espírito do pai continua vivo, através de uma árvore. Contrariado pela visão pagã de Joseph, o irmão Burton "mata" a árvore Desconhecido, mas não irreconhecível. O segundo romance de Steinbeck tem os seus aspectos mais crus, mas a constante tensão que irradia demonstra arte. A própria sinopse é reveladora de desgraça: Joseph obtém a benção do pai para se mudar para um vale na Califórnia onde, após a morte do patriarca, desloca os seus três irmãos. No novo rancho da família, Joseph acredita que o espírito do pai continua vivo, através de uma árvore. Contrariado pela visão pagã de Joseph, o irmão Burton "mata" a árvore e, a partir desse momento, a terra enfraquece e a desgraça abate-se sobre a família. A escrita de Steinbeck conheceu alguma evolução, no entanto, o nível apresentado aqui já seria bastante elevado. Em meu entender, um contador de histórias não precisa de utilizar artíficios muito complexos para prender a atenção e é aí que Steinbeck se distingue de Faulkner. Enquanto o último recorre a técnicas literárias que fizeram escola, o primeiro é puro, no sentido de extrair das personagens as qualidades únicas que definem o curso da narrativa e a descrição impecável da genuína "americana". Много трудно прочетох тази книга, въпреки че изобщо не е обемна. За съжаление, периодът беше такъв. Подхванах я в ужасен дефицит на свободно време и я четох с голяма мъка, имаше дни, в които успявах да чета "гигантски" пет-шест страници. Четях и на телефона, в парка, докато детето поиграе, а вниманието ми беше разпределено и на много други места. Най-лошото, според психолозите - разхвърлянето на вниманието, така човек се уморява много повече, отколкото когато се съсредоточи върху едно-единствено Много трудно прочетох тази книга, въпреки че изобщо не е обемна. За съжаление, периодът беше такъв. Подхванах я в ужасен дефицит на свободно време и я четох с голяма мъка, имаше дни, в които успявах да чета "гигантски" пет-шест страници. Четях и на телефона, в парка, докато детето поиграе, а вниманието ми беше разпределено и на много други места. Най-лошото, според психолозите - разхвърлянето на вниманието, така човек се уморява много повече, отколкото когато се съсредоточи върху едно-единствено нещо. Стайнбек си е Стайнбек. Някои описания бяха изключително депресивни и точно когато си обмислил внимателно как да си туриш вЪжето, изведнъж сменя посоката и те унася да четеш, кара те да тръпнеш и да крадеш всяка свободна минута, за да видиш какво ще стане. При него винаги има предвидимо възмездие, но винаги има и елементи на изненада, които изобщо не очакваш. Накрая затваряш книгата и си мислиш тъй простичкото клише: "Това е животът." Speravo in un'altra gemma della produzione di Steinbeck, ma sono stato parzialmente deluso. Ci sono molte (troppe?) belle descrizioni della natura, occupano forse la metà del libro e purtroppo vanno a scapito della storia e dei personaggi. Anche negli altri Steinbeck che ho letto la natura è sempre presente, ma è funzionale alle vite dei personaggi. In questo, al contrario, sembra che i personaggi siano accessori dell'ambiente. Il protagonista, Joseph, è un uomo quasi biblico che basa tutte le s Speravo in un'altra gemma della produzione di Steinbeck, ma sono stato parzialmente deluso. Ci sono molte (troppe?) belle descrizioni della natura, occupano forse la metà del libro e purtroppo vanno a scapito della storia e dei personaggi. Anche negli altri Steinbeck che ho letto la natura è sempre presente, ma è funzionale alle vite dei personaggi. In questo, al contrario, sembra che i personaggi siano accessori dell'ambiente. Il protagonista, Joseph, è un uomo quasi biblico che basa tutte le sue decisioni su ciò che Madre Terra suggerisce, pervaso di un misticismo che lo spinge a curarsi solo di se stesso, dela sua terra e degli animali. La sua fame di possesso si fece passione. “È mia” cantava. “Fino giù in fondo è mia, fino al centro della Terra.” Pestò col piede la terra soffice. Poi la sua esultanza divenne un acuto spasimo che gli passò attraverso il corpo come un fiume ardente. Si gettò col volto sull’erba e accostò la guancia agli steli bagnati. Le sue dita afferrarono l’erba bagnata, la strapparono e la strinsero ancora. I suoi fianchi batterono pesantemente la terra. Prenderà, una dopo l'altra, decisioni terribili. Un personaggio decisamente discutibile, per non dire odioso, a cui non ho potuto affezionarmi. کارای اشتاین بک موضوع های جالب و خاصی داره، فقط تنها مشکل من باهاش توصیف های زیاد از حدشه، این کتاب اگر جای ۳۰۰ صفحه، ۱۰۰ صفحه بود بی نظیر میشد. "Vi dico che quell'uomo non è un uomo, a meno che non sia tutti gli uomini in uno. La forza, la resistenza, il lungo e incespicante pensiero di tutti gli uomini e anche tutta la gioia e tutta la sofferenza che in essi si cancellano a vicenda senza uscirne. E' tutto questo, è il ricettacolo di almeno un frammento d'ogni anima umana, e più ancora è un simbolo dell'anima della terra." John Steinbeck è senza pari. Gli scrittori come lui sono pochi, i narratori come lui si contano sulla punta delle dita. Narratori veri, intendo, quelli che non si limitano a raccontare una storia, ma la mettono in scena semplicemente trasportandola dalla propria mente alla carta. Questo semplice gesto, scrivere la storia, ed è come se l'avessero già rappresentata a teatro e raccontata ad ogni singola persona, è come se fosse avvenuta davvero, fuori dal tempo e in un posto che non è qui, e loro fossero stati lì per vederla. I narratori come lui materializzano e fanno avverare le storie che raccontano e quello che in esse è racchiuso. Come facciano per me è un mistero; mi rifiuto di pensare che sia una mera questione stilistica, che a compiere la magia sia solo un qualcosa nell'ordine delle parole, o le parole stesse. Se credessi nel soprannaturale, direi che Steinbeck non era umano. E' l'unica spiegazione che mi si affaccia in mente. Al dio sconosciuto parla di Joseph Wayne, un contadino che alla morte del padre viaggia sino in California per costruirsi lì una sua proprietà, seguito poco tempo dopo dai suoi tre fratelli. Le cose vanno bene per un po', Joseph decide di prendere moglie, ha un bambino, la fattoria prospera, il bestiame aumenta. Ma poi si assiste a un tradimento, un voltafaccia, delle morti, la siccità. La famiglia si divide, la terra muore. Il finale è qualcosa di sublime, e per questo non ho intenzione di dirvi nulla a proposito. Tutto ruota attorno al legame che c'è tra Joseph e la sua terra, un legame che io definirei quasi di sangue, ma più ancora ruota attorno alla figura stessa di Joseph, un personaggio incredibile, divino. Riferendosi a lui, Rama, la moglie del fratello, dice: "Non so se ci siano uomini nati al di fuori della natura umana, o se alcuni uomini siano tanto umani da far sembrare irreali gli altri". Non è un personaggio facile da inquadrare; tutt'ora non ci sono riuscita. Questa natura "divina" (non so come altro definirla; e forse è l'aggettivo giusto) di Joseph è sottolineata da Steinbeck il più possibile. Lui si prodiga per la sua terra, è dappertutto, brama la vita e la venera. Il suo attaccamento profondo verso la terra e i suoi frutti, in particolare un albero in cui ravvede lo spirito del padre defunto, gli guadagnano i rimproveri del fratello Burton, il religioso convinto, che teme che Dio manderà una punizione sulla loro terra a causa dei culti pagani di Joseph. Quando l'albero muore, la nube della siccità inizia a incombere sulla serena vita della famiglia Wayne. Joseph distolse lo sguardo da lui per la vergogna. "Non mi riesce di proteggere il paese", pensò triste. "Il dovere di mantener la vita in questo paese è superiore alle mie forze." Arrivata qui, ho provato compassione per Dio, perché se davvero esiste e ci ama è così che si deve sentire, a patto che non sia onnipotente. Probabilmente ci guarda e sa che non può salvarci. Deve essere doloroso. Ma non ho intenzione di aprire una diatriba religiosa. Come ho già detto, la vicenda si conclude con quello che potrei definire come un colpo di scena, se l'espressione non mi sembrasse troppo colorita per l'austerità di questa storia, una storia d'amore, di fede, la storia della forza di un uomo che aveva capito che la vera immensità non è da cercare nell'alto, ma in se stesso e nella cosa più antica che l'uomo conosca, la terra. “La terra non muore" disse il prete deciso. Joseph lo guardo irritato. "Come lo sapete? I deserti erano vivi una volta. Perché un uomo è spesso ammalato e tutte le volte guarisce, è questa una prova che non morrà mai?" Padre Angelo si alzò dalla sua seggiola e restò in faccia a Joseph. "Siete ammalato, figlio mio", disse. "La vostra anima è ammalata ed è ammalata ed è ammalato il vostro corpo. Volete venire in chiesa per guarire la vostra anima? Volete credere in Cristo e chiedergli aiuto per voi?" Joseph balzò in piedi e gli fece fronte, furioso. "La mia anima? Al diavolo la mia anima! Vi dico che la terra sta morendo. Pregate per la terra!"